Kos Shel Eliyahu With Plate - Floral Blue. This artistic Cup of Elijah set is part of the Lily Art design collection. The set includes a glass saucer and a stemmed large Kiddush cup. The glass saucer is masterfully color stained with three areas of blue shading and an appliqued style decoration of half of a ball and leaves. 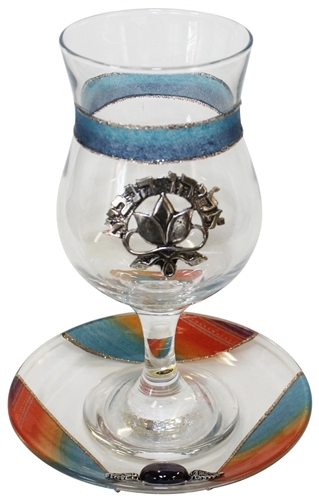 The stemmed large styled glass Kiddush cup has a matching blue strip with an affixed metal pendant with the Hebrew words “Eliyahu Hanavi”, “Elijah the Prophet”.